Merry Christmas from the Management and Staff of M.B Spares & Service. Welcome. Wondering what happened to the Newsletters?? Well things have been busy both at work and at home so the Newsletter had to be put on hold. When you see how many cars have been sold you will see what I mean! However here is a bumper Christmas issue for you. In this newsletter we have the details from the workshop open night, a piece of history form 1958, a great story of a trek across India in a 300b and heaps more. <?XML:NAMESPACE PREFIX = O /> On the 9th of November we had the Mercedes-Benz Club of the ACT at the workshop for a technical night. After a healthy meal of gourmet sausages and amber fluid ,the Club members were given a self guided tour (AKA Magical Mystery Tour) of our workshop. A copy of this tour is below. 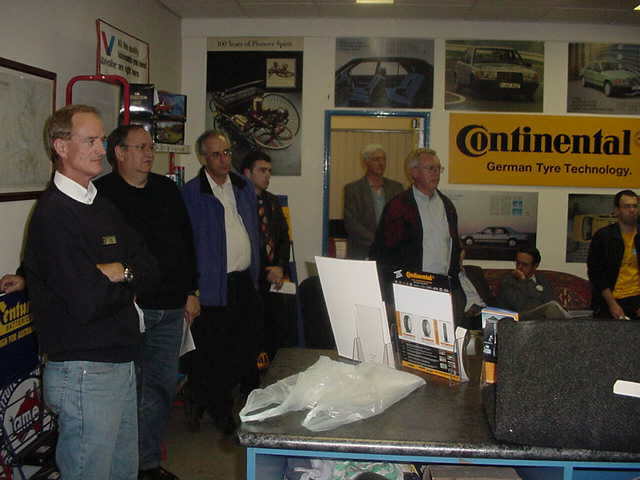 On the completion of the tour there was a quick quiz with the winner getting a free A/C Regas. The answers to the questions are below. After the tour we had a questions and answers session. M.B Spares and Service. Magical Mystery Tour!! - Enter front door, immediately on the right is the staff lunch room. 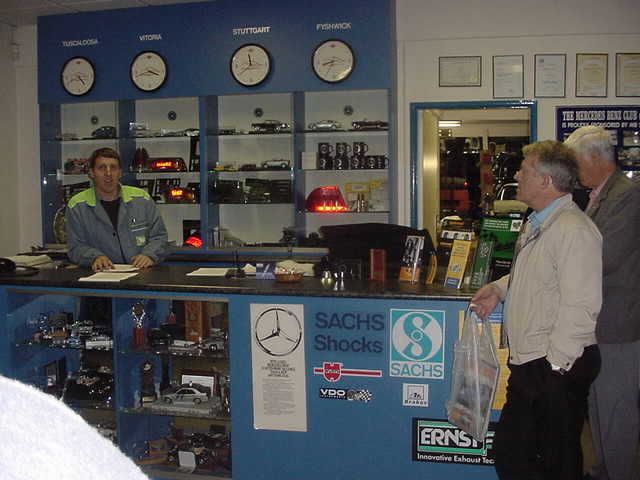 On the left is our parts and service counter. Here during business hours you will be served by either Chris Righton, who is our Service Manager or Murray Mules, who is our Spares manager. ,Both are members of the MBCACT. 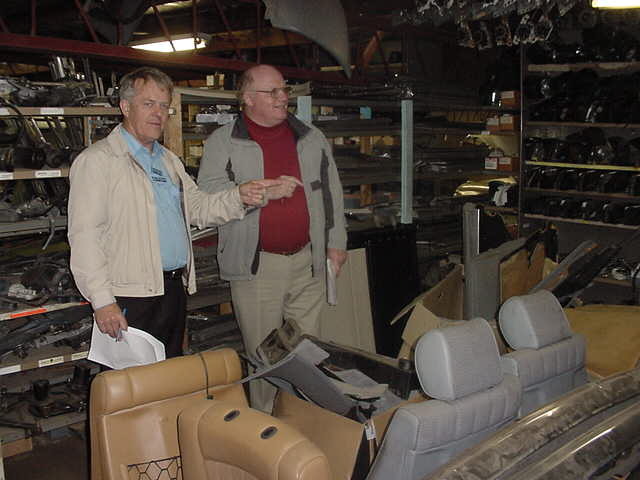 ,Chris drives a W114 280E and Murray owns a 1954 Type 220. - The clocks on the wall represent the different time zones from various Mercedes-Benz plants. - Enter the main office (the seat of power!). On the North wall you can see a selection of my collection of period advertisements from the 50’s and 60’s. Also check out the invitation for a Christmas party at the local MB dealer in Johannesburg SA from 1961. I also have some of my model collection in the cabinet. - In the book case is a selection of sales brochures and Australian Spec sheets from the late 80s and early 90’s. These are for sale at the prices marked. - Also on display is part of my collection of sales brochures and other Mercedes-Benz information. Recent additions to the collection include an original brochure for my 300b and a 220S Roundie brochure. Please treat these with respect. - On the table is a selection of classic car parts that we have imported from Germany. Every two weeks we get a shipment of rare and obsolete parts. Whatever you need we can get faster and cheaper than the local MB dealer. Parts include a set of tail lamp lenses for a W113, a W107 grille mesh, diff boots for a 540K (no joke), W113 engine bay sticker kits, a Roundie interior light, a thermostat and horn button. On the couch is a new boot mat for a W111 sedan or coupe. What ever you want we can get it. - Exit to the parts room. On the right you will see our range of New Owners manuals and on the left a pile of used ones. We try to keep as broad a range as possible. - Stop and have a chat to Murray our Spares Manager. Tell him what model your car is and ask him to look up a part for it on our Electronic Parts Catalogue. - Exit to the dispatch bay. From here we send parts all over the world. Every day at 4.30pm the Ipec truck calls in to pick up the days orders. If you have a parts problem whist travelling, we can arrange overnight delivery to anywhere in Australia. - On the right is the old transmission room. We now outsource transmission rebuilds due to there increasing complexity. On the shelves are stacked the job cards and required parts for the next three days worth of jobs. We operate a system that ensures we have the parts required at least two days before they car arrives. If the system fails we have two days to rectify the situation. - Enter our NEW dismantling facility. The cars are stacked on the racks by fork lift. The 230E and 300TD down the back have great engines in them but both have terrible bodies. The 300CE-24 front clip sitting on the Mezzanine floor will be used to convert the AMG coupe we own (one day). - Since the last workshop night we have completed the mezzanine floor and as with most expansions we have made it is now overfull. Have a wander around and see if you can find something that fits yours car (this is not an invitation to take it with you). Most of the parts up here are interior parts and exterior panels. The staircase is designed so that two guys can carry large panels up there without problems. - Under the mezzanine floor are the mechanical parts like transmission, diffs, brake parts, etc. Feel free to have a look around. - Walk to the back wall and turn left to the tyre bay. Here we fit and balance our own tyres. The tyre balancer is a German brand with a special adaptor to balance MB wheels as if they were on the car. The wheels are located by the wheel stud holes not the hole in the centre of the rim. As you leave the tyre bay the steam clean bay is on the right. The Blue unit on the wall filters the water that is collected in the sump on the floor and returns it to the sewerage system. This equipment is required for all workshops now in the ACT, however we were one of the first workshops in Fyshwick to install one. - Exit out of the workshop walking under the old W108 280SE 3.5 on the hoist. We have just removed the engine from this and will de dispatching it to Sydney tomorrow morning. To the right is a W115 230.4 that has just come in for dismantling. Before the cars are put on the racks they are put through a function test and if possible a test drive to ascertain what is worth recycling from it. For example the 3.5 on the hoist had a good engine but the auto would slip when cold. - Enter the new workshop and walk anti clockwise around it. Straight ahead is our trusty old four post hoist. Every Mercedes-Benz workshop MUST have one of these as you cannot lift the earlier Finnies and W108/109 series cars on a two post hoist without damaging the front subframe mounts and running the risk of the engine falling on the floor! To see an example of what happens go back to the dismantling yard and have a look at the front subframe mounts on the 220Sb finnie! - The car on the hoist is Ken Edwards 170S. Ken is one of the clubs life members. We have recently done some work on this to improve its driving habits. We made a set of 5.5” X 15” wheels for it so we could fit radial tyres to it! - In front of the engine rack is a Dynamometer that we purchased last year and are yet to install. We are planning to install it just inside the small door to the dismantling yard. Other imminent equipment purchases include an exhaust extraction system that connects to the vehicles exhaust pipe. Soon these will be a standard requirement for any workshop so just like the wash bay water recycling system we are getting in first. - The E280 on the hoist is connected to our Air Conditioning machine. This machine uses the environmentally responsibly R134a gas as recommended by Mercedes-Benz. Apart from gassing the A/C system this machine can also evacuate the system and recycle used R143a gas. This E280 is for sale and has travelled only 108000kms! - The 190E 2.3-16 on the next hoist is in for a variety of work and was driven down from Queensland so we could work on it! Work includes a rear suspension rebuild, full tune and various other repairs. The Rocker cover is off as it is having a crack in it repaired. Note the single row timing chain! Now that is a scary thing on a performance engine. The 190E 2.5-16 had a double row chain. - The 6.9 is in for a set of tyres and a miss in the engine (that could be expensive!). - My 300d is the next car. This car will (unfortunately) be for sale when we have finished waking it from its sleep. 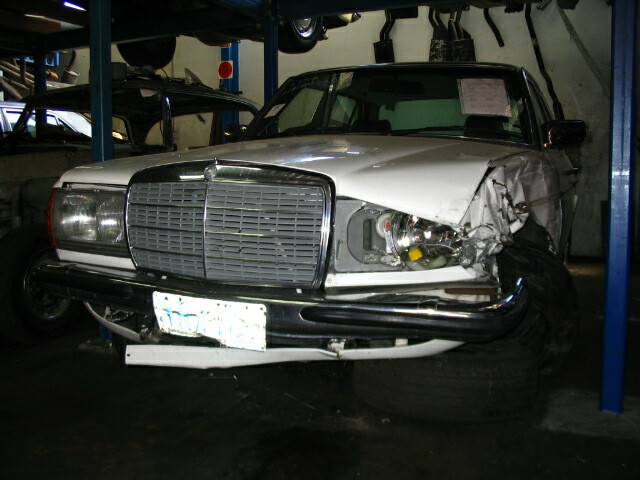 After that, is our Loan car, it is a W123 230E and is available free of charge while your car is being serviced. Booking are a must as it is very popular. - 220a, this car is having some work done including new front springs before being exported to the USA! - 230 Ambulance, Maybe the only RHD one left in the world. Very sick and has been worked on by butchers. There is a 100% rust free 230 sedan parked in front of it that we will be using to fix the errors of the previous people who have worked on it. - AMG 300CE 3.4 – 24. Super rare car, watch out for this car making an appearance at the 2006 national rally! It will be on the road and legal by then, but will have been for a holiday to New Zealand in the meantime. - 230 Cabriolet b. 1938 model, also possibly the last RHD model in the world. There were very few RHD versions made in 38. Car is complete but needs a very serious rebuild. Since the last workshop open night we have sourced many of the missing parts for this car including the engine. My father is seriously considering the restoration of this car, so one day we might see it back on the road. - Finally, a factory W115 stretch. This used to have a 220D engine but has had the engine bay modified to fit a 280e engine in from a 1982 model. It is one of two LWB sedans that we own. 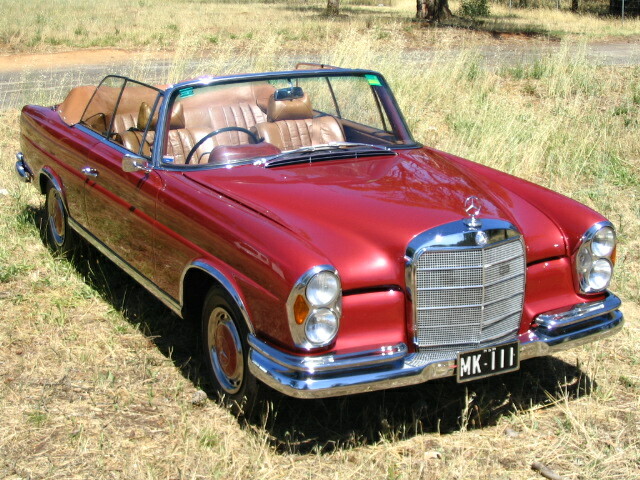 The other one is a W123 250 LWB sedan which is now for sale. - Last two cars are a pair of 250SE coupes. The two tone car belongs to Robert Gill who is an ex club member. It is for sale, see the display board. The other coupe is the one that was on the four post hoist at the last workshop night. The restoration of this car is almost complete. It is not being done to Concours standard but rather so that it is just a great looking car for weekend enjoyment. - Exit out the side door and check out the range of cars we have for sale!!! M.B Spares and Service is a Licensed Motor Vehicle Dealer (No.300). We source our cars mainly from MB dealers in Sydney and can track down what ever you want (within reason). We can also help you with lease or Hire Purchase arrangements via Daimler Chrysler Finance. - Did you notice the alloy wheels on the C200? We can supply you a wide range of German made alloy wheels ranging from 15” to 19”. Wheel and tyre packages are available. - Hope you enjoyed it. We will have a questions session after everybody has been around the tour. 1) Where is the photo taken of the racing version Finnie in John’s office? It is a photo of either Bob Jane or Harry Firth driving a 220SEb at Phillip Island in the Armstrong 500. 2) Who was the “Work place of the day” on 2CA today? M.B Spares and Service was the 2CA "Work place of the Day" on the 9th of November this year. Tuscaloosa is the MB plant in the USA that produce the ML class. 4) What model is made at Tuscaloosa? 5) What mileage has the C180 done? 6) What is the diff ratio on a W123 280CE? 1:3.46 there was a diff on the rack up the back with 280CE and then the ratio written on it. Just as a matter of interest all MB diffs from 1968 onwards have the ratio stamped into it on the lower left hand corner when viewed from behind. Wordy is Rob Gills nickname. he is the chap who wants to sell the partialy restored 250SE Coupe we mentioned a few newsletters ago. The number plate on a 190E bumper bar upstairs. 9) What is the interior in the box upstairs from? 10) What is the part number for a A160 air cleaner? 166 094 00 04, it was on the shelve behind Murray's desk. 11) What should you keep safe? Your vehicles Data Card, there is a sign explaining this on the front counter. 12) What did Mr Burn what? Now this is an interesting story. Amongst the old sales brouchers in my office is one for a W180 220S, it is still in the envelope used to mail it to a Mr Burns in Sefton Park, South Australia. The envelope is marked as being sent by Daimler-Benz in Unterturkheim, Stuttgart on the 21st of October 1959. The interesting fact is that the new W111 version of the 220S started production in August 1959, so why were they sending him the old version broucher? Maybe he was a collector. Who knows? 280SEL 1978 W116, very rusty but with good mechanicals, is a SEL so has heaps of options like electric windows, cruise control, rear headrests, etc, reasonable dark blue M.B tex interior. 280E 1981 W123, damaged on the l/h/f corner, local Canberra car with recent history of engine work. 380SE 1983 W126, engine has a slipped timing chain, reasonable grey leather and Zebrano timber, very original car with good options. So if you need any bits for your 280SEL, 280E or 380SE give us a ring on 1300 787 300 or e-mail the spares department. A new 190 for $3492.00?? No you are not dreaming, what appears below is a copy of a pricing and option list document from the USA in 1958! For those of you who know the value of the older cars just think what you have missed out on! run approx $200. + custom charges = 10% of depreciated value + 4% tax when registered. Allow 6-8 weeks delivery between date of order and delivery. * Matching 4-piece suitcase sets (fitted to trunk space) are $107.22 for the 180,190,219, 220S, and $147.72 for the 300 sedan. Becker "Mexico" runs from $217.89 in the 180D, and $300 in the 300d. * a Borg-Warner automatic transmission can be installed in the 300 sedan and coupe for $650. * other extras include center armrests, headrests, automatic radio antenna, additional heater blowers, fog lights, radiator (? )blinds, luggage racks, etc. Berlin-Arienfelde with a total of 40,000 employees in these plants. Distribution in the US is now handled by Studebaker-Packard (since May 1957). attend a factory school for 2 weeks to learn Mercedes service techniques. The factory schools are located in Los Angeles, Chicago and New York. Factory branch representatives are also located in these 3 cities. overpopulated and I see the end of all flesh before me. Build another Ark and save two of every living thing along with a few good humans." the height limitations. We had to go to the Development Appeal Board for a decision. it was cruel and inhumane to put so many animals in a confined space. flood. I'm still trying to resolve a complaint with the Human Rights Commission on how many previously disadvantaged individuals I'm supposed to hire for my building crew. Also, the trades unions say I can't use my sons. They insist I have to hire only Union workers with Ark building experience. To make matters worse, the Customs and Revenue seized all my assets, claiming I'm trying to leave the country illegally with endangered species. stretched across the sky. Noah looked up in wonder and asked, "You mean you're not going to destroy the world?". "No", said the Lord. "The Australian Government will beat me to it!" Volume 3 Disc 1 covers models: 190c/190Dc [W110] from 1961 to 1965, 200/200D [W110] from 1965 to 1968, 230 [W110] from 1966 to 1968, 300SE (W112 sedan and Coupe) from 62 to 67, 250S/250SE [W108] from 1965 to 1968, 300SEL (6 cylinder version W109) 65-67. Volume 4 Disc 1 covers models: 190SL [W121] from 1955 to 1963, 300SL Gullwing [W198] from 1954 to 1962. We will be selling these off at $110.00 each, this is a 50% discount off the normal price! Ring Murray on 1300 787 300 to order or you can e-mail him here. Check out this slightly modified 190SL! Here is an incredible story of a guy who drove his 300 across India. The E class has been with us since late 1993 when the W124 series was updated, however its history can be traced back much further. Click here to see a great article about the history of the E class. Speak/read Japanese?? Then have a look at the 25th Anniversary of the Mercedes-Benz club of Japan. have a real close look at the pictures and you will see a very rare W110 wagon. This years Classic Adelaide was the start of the 50th Birthday celebrations for the 300SL Gullwing. After the rally many of the participants drove from Adelaide to Melbourne along the Great Ocean Rd and then caught the ferry to Tasmania for a week long tour of the Apple isle. The Victorian Mercedes-Benz Club meet then along the Great Ocean Road for lunch. If you click here you can see some pictures. And if you click here you can see details on the official Classic Adelaide site. Plenty of action on the car front since the last Newsletter. See below for the list of cars that have been sold. We have heaps of new cars coming to replace them. These include a beautiful 420SEL with only 115000kms on the clock with full books and a very rare W111 220SEb Cabriolet. This car has had a lot of money spent on it and is truly stunning. In between Newsletters we had a C200 Kompressor come and go. The 300E that is in the "just arrived" list was traded on it. 420SEL 1987 model on 115000kms! C200 1996 model 176000kms Rare manual transmission!